The banking giant still languishes below its pre-financial crisis highs. Find out whether Bank of America can bounce back. Bank of America (NYSE:BAC) is one of the largest banks in the world, and the Charlotte-based banking giant has a long and illustrious history that dates back more than 200 years through its heritage banks. Yet even in such a long time period, the financial crisis in 2008 still marks the most critical time for Bank of America, and its entire stock history hinges on that key moment. Investors have enjoyed a nice bounce over the past eight years, but they still want to know if Bank of America stock can regain all of its losses and start making forward progress like many of its banking peers. Recent efforts have promoted growth, but there's plenty of disagreement about whether there's an upper limit to Bank of America's success that could stifle further gains. Over the past half century, Bank of America has gone through a couple of key periods of growth. The first came during the 1990s, when a period of economic prosperity pulled the entire U.S. economy upward. For its part, Bank of America took advantage of the opportunity to bounce back from tough times in the late 1980s, when the bank made substantial loans to emerging markets that went sour, especially in Latin America. The financial giant used acquisitions to bolster its size, including the purchases of California-based Security Pacific and Chicago's Continental Illinois National Bank and Trust. Bank of America sought to be the largest bank in the country, but it faced difficulty in keeping up with North Carolina-based NationsBank. 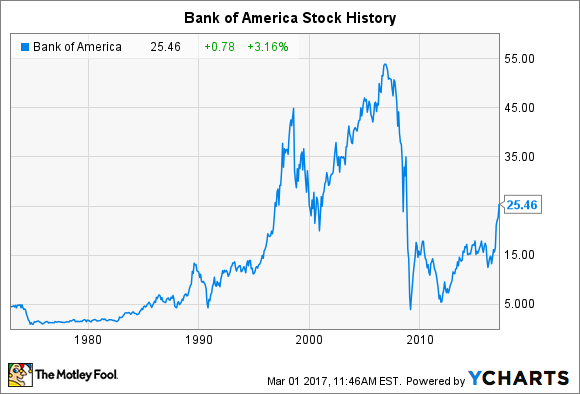 In 1998, NationsBank bought Bank of America, but after the merger, the bank kept the B of A name, and the share-price history above reflects the historical legacy of NationsBank as the legal entity that survived the merger. After the merger, the stock took a pause and gave up ground as investors looked toward the tech industry for outpaced gains, and the initial bear-market move in 2000 took B of A to its lows. Yet from there, Bank of America bounced back. The company took full advantage of the housing boom, and the stock price doubled between 2001 and 2007 as profits soared. That was even more impressive given the company's high dividend yield, which also added to total returns. The financial crisis sent the entire banking industry to the brink of disaster, and Bank of America suffered more than most. For B of A, the 2005 purchase of credit card giant MBNA proved to be an ill-timed acquisition, and the bank ended up having to write off between $20 billion and $30 billion in credit card loans each year from 2008 to 2010. Adding further pressure was the 2008 purchase of Countrywide Financial. The move gave B of A access to the largest mortgage origination company in the nation. But the housing boom had already cracked, and Countrywide used questionable practice to bolster its business that proved costly in the aftermath of the financial crisis. B of A ended up paying tens of billions of dollars in legal settlements, many of which were connected to abusive practices related to mortgage-backed securities and foreclosure actions. With the Federal Reserve forcing B of A to sell equity at a dramatic discount to its previous value, the resulting dilution dug the bank into a hole from which it still struggles to recover. Since 2009, the U.S. economic recovery has lasted far longer and pushed far higher than most investors anticipated, and Bank of America has seen dramatic gains. Yet only recently have shareholders really started believing in the B of A story, helping the stock double since the middle of last year. Stock buyback activity has accelerated, but the real story has been the election of President Donald Trump and the perception that the new administration will relax banking regulation. In addition, rising interest rates appear imminent, and that should help boost profits for Bank of America. If solid economic conditions combine with more favorable corporate tax and business provisions, then Bank of America could make a push to regain its pre-crisis highs. Investors have come a long way already, but they'd still like to see a happier ending to the B of A story.